Whatever God wants us to do next we cannot accomplish it if we do not change, if we do not move, and if we do not grow. He is looking for another level of growth. Everything we do, we must do from the heart because that is who we are. We love to give. We believe the Bible is the answer to all life problems. We believe in networking ourselves together. We are to restore the church, which means we are going to lift up a standard of righteousness. We are here to destroy the works of the adversary. We are here to leave a deposit in the earth for the next generation. Our life is meant to be a deposit for those coming behind us. We have to understand why we are here. We are made for God’s purpose. 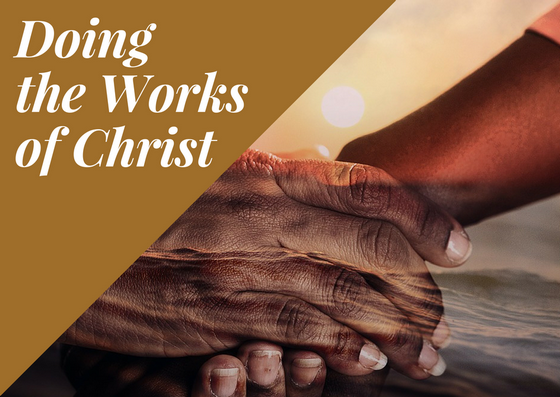 We must to do the works of Christ. The Lord wants us to live a life that makes a difference eternally. We cannot do the will of God out of human effort and human strength. The work is that we have to get the Jesus in us into the unbeliever. We have to have the power of the Holy Spirit to do this. We cannot do it by ourselves. a) It causes your to trust Him with your whole heart. When you know He is alive in your heart, then you can trust Him and depend on Him. There is evidence that He is faithful and trustworthy. You can trust Him. It is the Holy Spirit that changes your heart. When you are baptized with the Holy Spirit and when you release the power that dwells in the inside of you, then you know that He is alive in you. When you know that He is alive in you, then you will trust Him. b) It causes you to believe with your whole heart. Once you believe who God is, then you can believe what God says and follow His instructions. c) It causes you to have boldness and no doubt. You have doubt when there is fear of rejection, failure, or unbelief. When you have evidence of who God is, then you can have unshakable confidence and boldness. When your heart is truly changed, it creates a desire to be right with God. Your responsibility is to get right and stay right with God. Our responsibly is to get right and to stay right with God. A heart for righteousness is a heart that agrees with God’s heart. When we have God’s Word, we have His heart; His thoughts, plans and desires for us. When we are right with God, we have peace and we produce fruit.